Although millions of Westerners practice yoga simply for its health benefits, the philosophy and wisdom behind the multifaceted discipline have far more to offer. 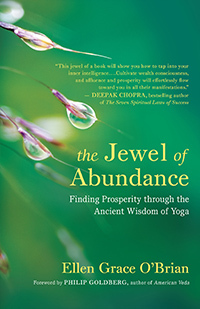 In The Jewel of Abundance: Finding Prosperity through the Ancient Wisdom of Yoga, award-winning author and Kriya Yoga teacher Ellen Grace O’Brian reveals an overlooked aspect of yoga: its powerful teachings on prosperity. She draws upon the ancient Vedic tradition of yoga philosophy and practice and shows how spirituality and earthly success can complement each other, leading to realization of the higher Self. O’Brian presents a clear explanation of both the philosophy of yoga and the nuts and bolts of practice, such as setting up a daily meditation routine, incorporating mantras, discerning how to cooperate with universal principles for complete well-being, and cultivating mindfulness in action. We hope you’ll enjoy this excerpt from the book, and we wish you a wonderful Thanksgiving. Amy Ippoliti, cofounder of 90Monkeys.com and coauthor of The Art and Business of Teaching Yoga, offers yoga teachers advice for distinguishing themselves in a crowded marketplace. For more New World Library author interviews, visit our YouTube channel. Let’s face it, we all experience stress. I’ve been teaching and practicing yoga for over 30 years, and I still do. Stress is the body’s way of responding to external forces and is a powerful indicator that we need to pay attention to something before serious problems occur. However, unhealthy levels of stress can delay healing and aggravate existing health issues. Studies have shown that practicing yoga can decrease levels of the powerful anti-inflammatory stress hormone cortisol. The adrenal glands secrete cortisol as a response to stress. But when we suffer from chronic stress and our cortisol levels are kept high, our immune systems are impaired and our bodies’ systems are endangered. The infinite is indeed within. Deep in our own psyche — within everyone’s psyche — lives the framework of the human journey. These structural archetypes are the substructure of thousands of years of our collective hopes, dreams, desires, failures, and fears. These archetypal, shared experiences of the collective unconscious provide a common architecture for the stories — that is, the myths — we tell ourselves about our humanity, about our struggles and triumphs. When dressed up, brought to life, and vivified through our imagination, our mythic stories allow us to witness what is deeply inside us at play in front of us. Myths give us the context and the capability to bring our inner world out. We hope you'll enjoy this interview with Alanna Kaivalya, author of Sacred Sound, and invite you to subscribe to New World Library's YouTube Channel for immediate access to the latest author interviews, book trailers, and more. We hope you'll enjoy this interview with Meagan McCrary, author of Pick Your Yoga Practice: Exploring and Understanding Different Types of Yoga.